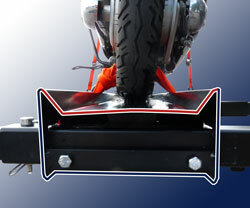 Our competitors' carriers use a basic "U" shaped rail to support the weight of your bike. This "U" shaped design is more likely to twist and bend over time with extended use. Our superior design will prevent these movements allowing you to transport your bike safely with a decreased possibility of twisting or bending. This will extend the life of your carrier. Here you can see the difference. The red part of the outline represents where our competitors stop. The blue? That's the VersaHaul advantage. 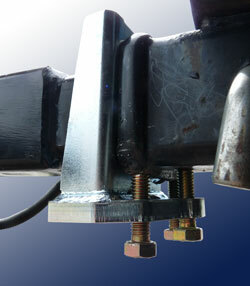 The patented anti-tilt lock bracket is designed to increase stability of any hitch mounted product. Differences in paint or powder coat thickness or slight imperfections in the manufacturing process could cause your carrier(s) to move within your hitch. The patented anti-tilt lock bracket addresses these concerns and will eliminate the majority of this movement. 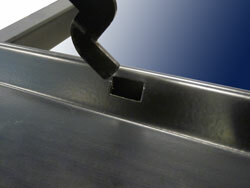 The patented anti-tilt lock bracket is an optional feature and is not necessary when using our carriers. However, VersaHaul provides you with this additional stability and peace of mind for FREE with any carrier purchase, and its use is recommended. Vehicles come in a variety of shapes and sizes. You shouldn't have to worry about hauling a spare tire, or having a bumper that's too big. We believe that if your vehicle can take the weight, our carrier should let you haul it. The VersaHaul was designed with a moveable rail, allowing you to move the main rail closer to or farther from your vehicle, giving you the space you need. That's the versatility of a VersaHaul. The fexibility of a VersaHaul doesn't stop at sliding the rail. VersaHaul rails are completely reversible, giving you the ability to load the bike from either side. This is ideal for individuals with ofset spare tires or ladders on their vehicles. 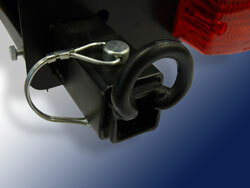 The average Class III hitch can tow up to 5,000 lbs., with a 500 lb. tongue weight. 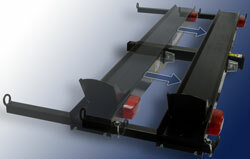 A Class IV hitch can increase that up to 10,000 lbs., with a 1,000-2,000 lb. tongue weight. With a VersaHaul, you don't have to let that towing capacity go to waste. 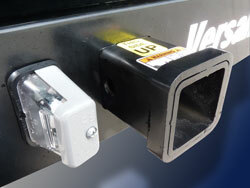 VersaHaul is the ONLY motorcycle carrier with a Class III hitch at the end of our carrier. That means you can haul trailers up to 3,000 lbs. behind your bike. No other carrier on the market offers that. The tie-down system VersaHaul has designed ensures maximum safety and minimal stress on your bike. Our tie-down bars give you the ability to align the straps with the suspension of the bike, causing less stress on the suspension while securely strapping your bike into position. A number of our competitors provide tie-down points in the center of the carriers, directly off the main tube. This causes unnecessary stress and over time can damage your bike. 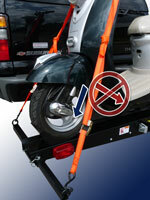 We build our carriers with Retractable Tie-Down Bars, so you can easily move them out of the way when not in use. Just pull out the locking pin, and slide them in. With our retractable tie down-bars you are also able to increase or decrease the angle, creating more stability depending on your bike's specific needs. The tie-down loops are one of the most important parts of the carrier. A wheelless trailer doesn't do much good if the loops can't support the weight of the bike while you're driving. Like the rest of our carrier, the loops are 100% steel. You can rest assured your bike is in good hands with VersaHaul. Wheels stops are designed to help stabilize your bike. But they're not very useful if the wheel stop is too far down the rail for your bike. It's important to keep the bike centered on the carrier. With a VersaHaul carrier, even smaller bikes can enjoy the same stability features that larger bikes do. The Adjustable Wheel Stop is easy to move too. All you have to do is slide the hooks into the slots built into the rail. Fasten the included bolt down and you're ready to go. It takes seconds, not minutes. And it's one of the little details that makes the VersaHaul superior to any other carrier on the market. 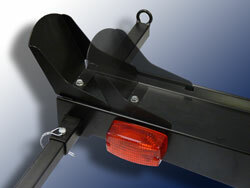 Hitch mounted trailers can cover or obscure your brake lights. This could reduce visibility at night, so we include a pair of reflectors with every carrier. 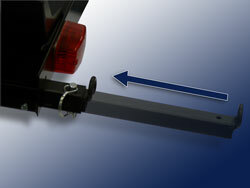 Some states require you to have a taillight kit if you extend an object beyond a certain point on your hitch. If you're worried about visibility, or are required by law to add taillights, pick up a VersaHaul taillight kit with optional license plate light. This increases visibility, keeps you legal in every state across the country, and provides you with turn signals, break lights and blinkers.